Here's What We Know About Neil Gorsuch Neil Gorsuch is the president's nominee for the Supreme Court. What do we know about him as a person? For one, he likes to drive a convertible with the top down. Neil Gorsuch is the president's nominee for the Supreme Court. What do we know about him as a person? For one, he likes to drive a convertible with the top down. Joining us to talk about Gorsuch is NPR legal affairs correspondent Nina Totenberg. Good morning. GARCIA-NAVARRO: So Nina, you've been justifying your salary, I think, this week, grinding out about a dozen pieces. It's been pretty busy. What have you got to tell us that we didn't know before? 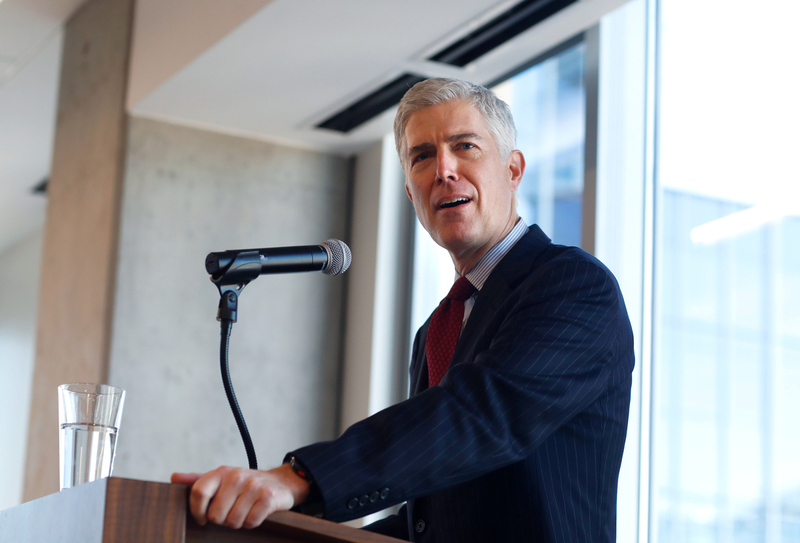 TOTENBERG: That Judge Gorsuch, the quintessential proper-looking, proper-acting gentleman drives a gold-colored Mercedes convertible and that he drives it with the top down as often as possible. TOTENBERG: That's my best shot. That's it. He lives on a ranch with a couple of horses, some chickens, his wife, two teenage daughters and a barn cat. He is from Colorado and, if confirmed, would be one of three justices not from the East Coast. But what really makes him the diversity candidate is that he's a Protestant and would be the first Protestant on the court since 2010, when Justice John Paul Stevens retired. There were six Catholics when Justice Scalia was alive and three Jews. Now there's going to be a Protestant. GARCIA-NAVARRO: Ah, diversity. That's good (laughter). You've been talking to people all week about Judge Gorsuch. What kind of judge is he? Give us a glimpse of what people have told you. TOTENBERG: His colleagues, Democratic and Republican appointees on the court, really love him. He's a good listener. He's easy to work with. He's not someone who skews the facts to fit what he wants. One Democratic appointee said to me - we could do a lot worse (laughter). In the rest of the legal community, especially those who argue before the court and study the court, he's widely respected and he's liked. Here's what professor Melissa Hart said. She's the director of the center for the study of constitutional law at Colorado University. MELISSA HART: I do think he's a relatively good choice. Any nominee put forward by this president is going to have views that concern liberal groups. And therefore, that, relatively, is important. He's a conservative judge, certainly. But he's a conservative judge and a very decent man. TOTENBERG: So you might guess from that that professor Hart is a liberal. But what you don't know is that she's the granddaughter of the late Watergate special prosecutor, Archibald Cox, who was fired by President Nixon. TOTENBERG: And she thinks that Gorsuch is a straight-shooter when it comes to presidents abusing their power, which she sees as rather important at the moment. And lawyer Neal Katyal shares that opinion. He served as chief advocate in the Supreme Court for part of the Obama administration. He's taken a lot of heat for a piece he wrote in The New York Times saying that Gorsuch should be confirmed. There's a lot of bad feeling among Democrats for the nearly year-long refusal by the Republican-controlled Senate to even consider President Obama's nominee for this seat. But here's what Katyal said. NEAL KATYAL: He's just an - a really fabulous judge. He's a judge's judge. And, you know, I certainly wish that the Democrats won the election and had their own person up there. But in this world we are in, what I care most about is a judge who's going to be independent from the executive and call it like he sees it. And that's how I see Judge Gorsuch. GARCIA-NAVARRO: So a lot of positive feedback. I understand he's also supposed to be a really terrific writer with a very readable style. GARCIA-NAVARRO: (Laughter) That's NPR's Nina Totenberg joining us.